Here is something a little different from the July 1919 issue of Flight Magazine.. Copied from the archives of Flight Global. It deals with the forst Atlantic Crossing of the Airship R-34, to include the actual flight logs.. These articles are really interesting. it may be of interest to recall an unsuccessful attempt made nine years ago. Brig.-Gen. E. M. Maitland, C.M.G., D.S.O. later picked up by the Trent. The airship after being relieved of so much weight, rose to a great height and soon disappeared. by a British crew, to accomplish this feat. morning,* after a voyage which up to late last night even experts feared might end in disaster. and Mineola into the streets to see the R 34 slowly circling overhead as she maneuvered herself in position for landing. parties had made the airship fast, the crew descended to solid ground and immediately began to stretch their legs. Hot coffee, food, soap and water were their immediate needs, and these were supplied on the spot in plenty. at her to realize that she has just completed so v a s t a journey and will in 48 hours calmly undertake another. until her arrival at Mineola at 3 p.m.
at 1 p.m. to-day (British summer time) the position 55 deg. 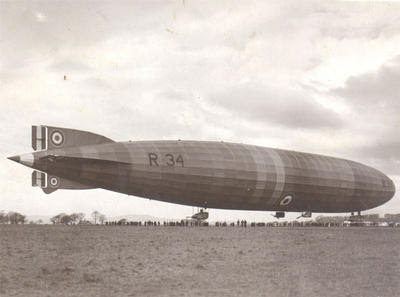 3.15 p.m.—A wireless message from the R 34, at 3.15 p.m.
(British summer time), gave the airship's position as 53 deg. West true and the speed 31 knots. chart published in The Times of July 7, the various positions of the R 34 as indicated by wireless messages are shown. R 34 : " Position at 4.30 p.m. G.M.T., 53.50 N., 18 W. ;all well." The Air Ministry adds : " The position given in the previous signal is probably incorrect and may possibly have been wrongly transmitted. The position indicated in the above message is very probably correct." 18.20 West, steering South, So.00 West true. at 30 knots and at a height of 2,000 ft.
' Arrive about Friday morning. Report speaking us.' "
by himself and two engineers before being applied. peculiarities, it should not be made just as accurate. an hour. Visibility only half a mile. Very rough sea. Torrents of rain. Despite this the ship is remarkably steady. eventually came out over the top of it at 3,400 ft.
golden lining as the sun sinks low. breaking through the black clouds immediately above it. a cat smuggled on board by one of the crew for luck. who wears one of his wife's silk stockings as a muffler, to Maj.
have yet seen on this journey. over cold currents of water the clouds cling to the surface. is full of enormous pieces of ice, small bergs in themselves. Newfoundland, is exactly 59 hours.
" 2.30 p.m.—We are crossing Newfoundland at 1,500 ft.
in thick fog, which gradually clears as we get further inland. his machine to greet us. We replied, giving our position. 38 to 40 knots, and heading for Fortune Harbor. of Miquelon and St. Pierre, steering a course for Halifax. Sydney (Nova Scotia), from St. John's, the first we have seen.
" Saturday, July 5, 2.30 a.m.—Very dark, clear night. number of small rivers and lakes. five at once owing to the petrol consumption. Lieut.-Com. in case we should run out of petrol during the night.
" 3.00 p.m.—Passed Haute Island in the Bay of Fundy. atmosphere, and look rather like a bunch of grapes. left Nova Scotia well behind, heading straight for New York. A particularly fine electrical disturbance at time of sunset. lengthen the distance to get clear of these storms.
" July 6, 4 a.m.—Sighted American coast at Chatham. "4.25 a.m.—Are over the south end of Mahoney Island. "Landing 1.54 p.m., Greenwich mean time, or 9.54 a.m.
United States summer time, at Hazelhurst Field, Long Island.
" Total time entire voyage 108 hours 12 mins." Field. Dispatches came in that the airship was cruising slowly south-west along the Canadian coast into head winds. wireless station which, though it indicated a great short-, age of gasolene, showed that there was good hope of landing. The message ran :—Following received from ' R.34 ' :— ' Position " R.34 " 67.30 W., 43.20 N. ; course S.W. by S.
messages given above were received Admiral Benson, Chief of Naval Operations, sent out instructions. dirigible's position, trying to establish radio communication. 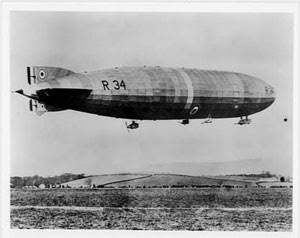 Early this morning this message came from the Bancroft showing that the ' R.34 ' might be able to reach Chatham. It read :—' To Commandant, First Naval District : position 41.52 N., 58.04 W., headed for Chatham at 23 or 24 knots. dirigible base, is not fitted for large ships, and it was cleared that it might be impossible to berth her there. Had Maj.
according to a message received from him, of fuelling, and proceeding to Mincola, possibly to-day. supplies of hydrogen and fuel, a good landing place, and plenty of vessels about in case of an enforced descent into the sea. I t was also accessible for the men who had been trained to handle ' R.34 ' on landing-—an important consideration. 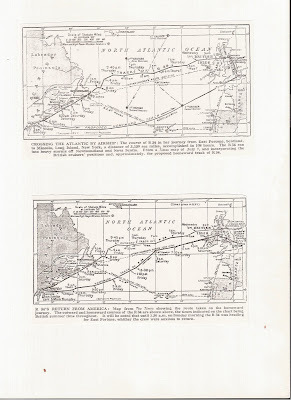 successfully crossed the Atlantic and dealt with subsequent difficulties." " R 3 4 " In our Editorial comment we are referring to the lessons that are to be learned from this great trip of the " R.34,"
of the deductions that have been made by members of the crew of " R.34 " and by others equally qualified to judge. Atlantic regularly but would establish trade routes in the Mediterranean and in the Pacific. almost a miracle that we completed the trip successfully after what we went through last night." Maj. G. H. Scott, R.A.F., commander of R 34.
in Norfolk, early on Sunday morning after a voyage which had taken 75 hours and three minutes. Pulham about 6.22, flying at 800 ft., landing safely at 6.56 G.M.T., exactly an hour after she was first sighted. 8 o'clock. She had accomplished the flight from Long Island in 7; hours three minutes. dipped and headed for it, but rose again suddenly and swept overhead as if unwilling at last to come to earth. minutes the landing party had the airship under control and were hauling her nearer and nearer to the ground. out into the Atlantic. It was an extremely good " get-away,"
considering the gusty wind and difficult conditions generally. We find we have 4,600 gallons of petrol for the return journey. and miles of tiny bright twinkly lights—a veritable fairyland. behind it, presumably an illustration of its speed. rides out very steadily under the circumstances. out of our five engines running, the fifth engine resting. kind American friends is very nice and warming. the Old World and the New. 83 m.p.h., on four engines. The forward engine stopped. heart of one capital to the heart of the other. 10.45 a.m.—Cooke asleep under the dining-room table. realise we were travelling at all. while Luck has relieved Greenland in the fore car, Corpl. wishing us success are received from America and Canada. 4.50 p.m.—Position 42.15 N., 54.05 W. ; course 140 deg. of the distance between the two countries. his position by observation on the sun and sea horizon. near us, and we are on the look-out for her on the wireless. have heard the delightful things that were said about them. point of vantage in the ship. and two wing engines. Weather clear, sea moderate. is from south-west. The reason for this is an interesting one. We are over the Gulf Stream on a north-easterly course. keep at 3,000 ft., when we have a steady wind from southwest. over there some hundreds of miles away. 9.15 a.m.—Clocks have now been put forward one hour. quite a nice one-step together. if required. We replied—propose to land at East Fortune. One engine completely broken down. the decision is a wise one. and we can only look at the sun for a moment or two at a time. 5 p.m.—We are back again in the clouds with no visibility. Picked up H.M.S. Cumberland on our Marconi spark set. to get her with our directional wireless, but without success. raining very heavily since 5 o'clock. Scott goes up to 5,000 ft.
7.35 p.m.—We ask H.M.S. Cumberland for a weather report. 18 m.p.h., overcast, passing showers, and clouds above 1,000 It. is necessarv and what is not. 8.30 p.m.—Still pouring with rain. Height 4,000 ft.
extraordinary sight suddenly presents itself beneath us. us and the sea. This cloud formation is called " ball cumulus." engines owing to rain clouds. crew who happened to be on duty at the time. with S.W. wind is quite an average day in mid-Atlantic. they are climbing a steep mountain face. welcoming us back to England. clouds again. Clear blue sky and sea. No sign of a ship. to tell, and it is now rather disappointing to find that a N.E. wind is preventing us from making more than 28 knots. We shall be breakfasting in the air again to-morrow, after all. Atlantic will, I am afraid, never be realized. interesting cloud formation on our port beam takes the eye. carried by an upturned vertical current. headway at this height, 32 knots. Wind N.N.W., 25 deg. 6.50 p.m.—We ran into a sudden squall from north-west. 7.15 p.m.—Another squall, but not a big one. to see who will fix on the exact spot when we cross the coast. Irish coast is exactly 61 hours 33 minutes. of Castlebar flying past us and under us, waving a welcome. Crew of the R 34 on return journey:—Officers:—Maj. engineer officer (Ship's Officers) ; also Brig.-Gen. E. F.
Maitland, C.M.G., D.S.O., representing Air Ministry ; Maj.
Hemsley, United States Aviation Army Department; Maj.
F. Borowdie, air-mech. 1st Grade (last five riggers). Flight-Sergt. ; N. A. Scull, Flight-Sergt. ; J. Shirwell, Sergt. B. Evenden, Sergt. ; P. Cross, Corpl. ; G. Gray, Corpl. G. Graham, 1st Air-Mech. ; F. Mort, 1st Air-Mech. ; J. Northeast, 1st Air-Mech. ; R. Parker, 1st Air-Mech. ; E. E.
Under-Secretary of State for Air; Maj .-Gen. Sir H.M.
Trenchard, Chief of Air Staff; Maj.-Gen. Sir F. H. Sykes. Controller-General of Civil Aviation ; and Sir A. Robinson. Secretary of the Air Council. 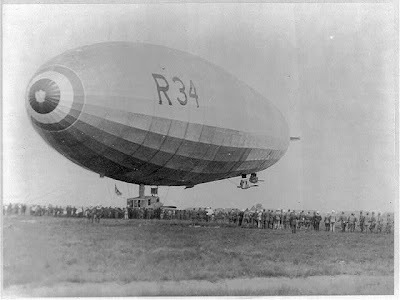 6.20 a.m.—Over Pulham Airship Station, and 6.57 landed. quick journeys. A second object of the voyage was to cement the friendship between this country and the United States. saving. The parachute, I am convinced, will be used in all air craft, but will be of particular value to the airship. because an airship with its petrol expended is very light. We have begun experiments in mooring ships in the open. enable them to sustain a rate of 70-80 miles an hour. The cross-Atlantic route, I think, will vary with the weather. R 34 entering the hangar at Pulham on Sunday, July 13, after her successful return journey from America. say, and the airship's passengers would disembark by coming down inside it in a lift. which failed coming home, the connecting-rod broke, and the engine was completely wrecked." 108 hours. On leaving Long Island we proceeded to New York, and were over the city between midnight and 1 a.m.
which yielded to light and various breezes. We met much low cloud and fog, and could take no sight of any sort for 24 hours. There can hardly be for aircraft, as for surface ships, more orless fixed courses." and as all the world knows by now, his post demanded the most constant attention. Freshwater, Isle of Wight, was by a curious coincidence born in a house which was the property of Gen. Sir J. B.
on Monday. Our Allies will be glad to know that his mother is French. all on fire ! " Shotter, exhausted by his labours, calmly replied, " Well, go and put it out ! " Service ever had so gruelling a test before, and few would have emerged with such honor. after the completion of your memorable and, indeed, unique Transatlantic air voyage.—GEORGE, R. and I." in the accomplishment of this epoch-making event.— W. A. ROBINSON, Secretary, Air Council." magnificent achievement in making the double journey across the Atlantic.—TRENCHARD, Chief of Air Staff." consider, one of the main stepping-stones in long-distance aviation." airship to cross the Atlantic a message of good wishes to the people of Canada from the Old Country." successful endeavour may tend to bring closer together all the great English-speaking nations." Edwards and the stowaway Ballantyne in the crew of the R 34 on the return flight. three officers were entertained at luncheon in the House of Commons by Gen. Seely, Gen. Trenchard, and Gen. Sykes. each day between 2 and 8 p.m., and large numbers of people have taken advantage of this opportunity. which sailed on " R.34." Graham, however, refused to part with it. THE " establishment " of the R.34 included two carrier pigeons, but one escaped in America.